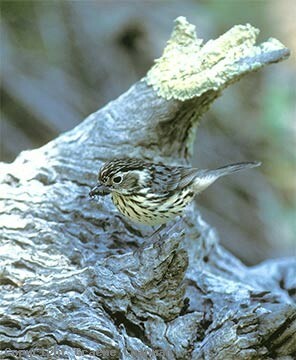 Speckled Warblers spend most of their time quietly foraging in pairs or family groups across the ground in the drier forests of eastern Australia.They range from western Victoria to about Rockhampton in Qld. West of the Darling River they are replaced by their close relative, the Redthroat. Amongst the litter where they feed, usually in the shade, Speckled Warblers are so well camouflaged that often the first clue to their presence is the sweet little song of the male or if you happen to disturb them, the distinctive whirr of wings as they fly away - they are fairly shy little birds and rarely allow a close approach. Most of their time is spent on or near the ground, but singing males sometimes ascend a tree a few metres or so. 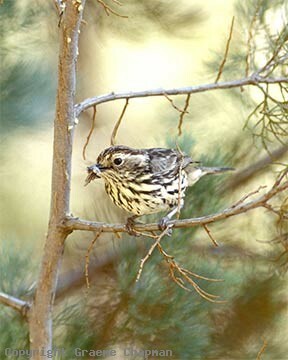 Speckled Warblers are amongst a suite of small birds that have struggled to survive in the agricultural zones and these days the best places to find them are in the state forests and national parks and other wooded places where there is a thick layer of litter. 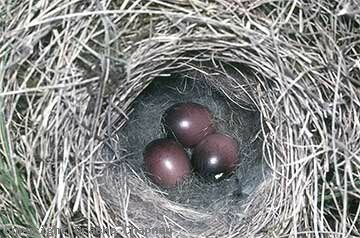 They build a small grassy nest, often lined with soft animal fur or feathers and lay beautiful deep red coloured eggs (see pic 504204). The nest is secreted on the ground, often near a log or a stone and sometimes even slightly below ground level which renders it virtually invisible from most angles. Only the female incubates the eggs but both adults feed the young. 504201 ... Speckled Warbler, male with dark brown eyebrow. 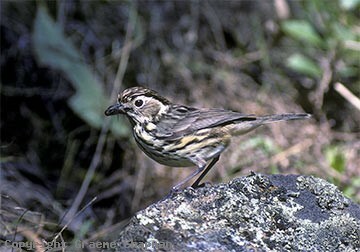 504204 ... Speckled Warbler's nests are usually lined with soft fur. 504205 ... Speckled Warbler, female with reddish brown eyebrow. See also Display Print LP-060.